Hot potato soup is creamy and comforting, but traditional recipes are loaded with fat and calories. 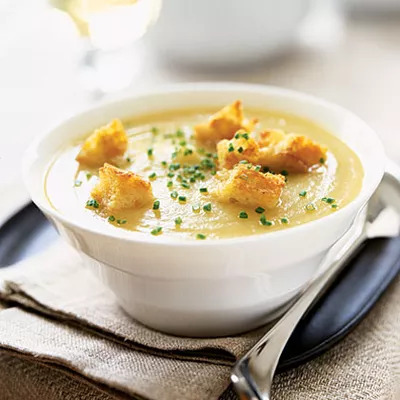 For a healthier take on this winter favorite, try this recipe for Golden Potato-Cauliflower Soup. This soup is so easy to make, and uses simple ingredients that you may already have at home. It replaces high-fat, high-calorie ingredients like bacon and ham with cauliflower, a superfood that has more vitamin C than oranges and is packed with memory-boosting B vitamins. Plus, it includes fiber-rich potatoes and celery, another superfood. Add some shallots to make it savory, croutons for crunch, and cumin and red pepper to give the soup a spicy kick. This soup is also versatile. Worried about carb overload? Just ditch the croutons and some of the potatoes and add more cauliflower. In fact, pureed cauliflower has a surprisingly lush and creamy texture that melts in the mouth. Another option? Swap Yukon gold potatoes for sweet potatoes to get a healthy dose of beta-carotene and vitamin A.